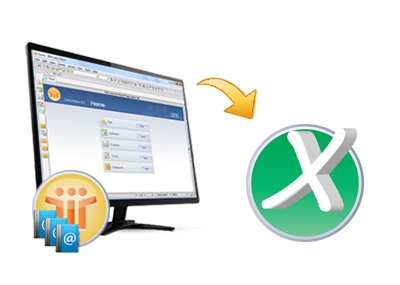 Today user may find many products related with Lotus Notes to Outlook conversion or any other mail client but there is too much less availability of the software which are able to convert Lotus Notes to MS Excel or in any other application. But now the user be tension free because here is a software that can be used for exporting IBM Notes Contacts to Microsoft Excel within an easy process and without any migration concern. Notes to Excel Software is an effective Notes Address Book conversion tool to export Notes address book to Excel. It converts Lotus Notes contacts to Excel(.xls file). The Notes to Excel Contacts migration tool will convert all the contacts details from names.nsf to CSV file. All the attributes of the contacts remain intact and not even a single bit of information is lost after conversion. The tool generates the preview of selected contact with all the associated fields in the preview window. All the attributes or fields and the details encapsulated into them remain unchanged after conversion. The tool scans the names.nsf file and lists all contacts in an alphabetical order. Particular contact details can be previewed in tool window by clicking and expanding the appropriate alphabet from the list. The tool exports all the attributes of names.nsf to OE-Contacts.csv file. The complete information for each contact from NSF file is successfully converted to Excel file that can further be imported into Outlook Express Address Book. Once conversion process is completed, tool will automatically save the converted file to the same location where names.nsf is located. The file can be viewed at the NSF source location in the name of OE-Contacts.CSV. The simple Graphical User Interface makes it easily understood by all kind of users and the process to convert Lotus Notes contacts to Excel can be carried out easily. The design of the tool makes conversion process easier. Does this software support any other Operating System except Windows OS? No, Notes to Excel only supports Windows Operating System. You can execute this tool on any of the Win Operating System. Does this tool support bulk migration of Notes contacts to MS Excel at a time? Yes, the user does not requires to click on single contact entry to migrate while this Notes to Excel Software automatically performs bulk conversion of Notes contacts to Excel. I have 1000 contacts in names.nsf file and want to convert them into .xls file. How much time does this software will take to convert them? The time software takes for migration and software's migration speed will depend upon data to be converted. And also it depends upon system configuration. Please elaborate the difference of software's Business and Enterprise License versions? Business License of Notes to Excel converter is useful for the single user/ organization when this tool will be used in a building and on multiple systems. And the Enterprise License will be used on multiple systems but also on different locations. By mistake I had deleted some important contacts. Does this utility will get back those deleted NSF contacts into MS Excel file? No , this software only migrate the contacts which are existed in names.nsf file at the time of migration.